Start of those New Year Resolutions with Amy’s! You are here: Home / Archived Content / Start of those New Year Resolutions with Amy’s! It’s almost the New Year! Time to start thinking about those New Year resolutions! You know….all those ones that are so hard to keep after a week or two! I know that one of mine is to eat healthier. I know…it sounds so much easier than it really is! Well…it is easier with Amy’s! I am a big fan of their food products especially since I don’t eat a lot of meat. I like that they also have products for those with special diet needs. Check out their website for more details and to learn about all of their products! These are a couple of my new favorites for the New year! The have Chili! 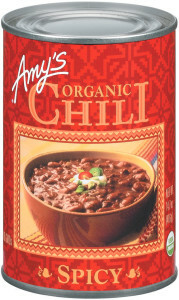 I so love Chili in the Winter so I was thrilled to learn that they have Organic Chili! My favorite is the Organic Spicy Chili. It is quite spicy but not too much so! I like my chili to have a kick to it but not so spicy that my mouth is on fire! 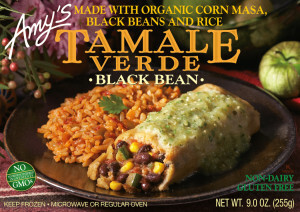 This is made with organic red beans and tofu in a Mexican sauce that makes for just the right amount of spicy! No Trans Fat, no added MSG and no cholesterol either! Just yummy! I received a free coupon to buy it and found it at Sprouts. I do love Tamales! I think I may have had one too many over the holiday! I tried both the Tamale Verde Black Bean and the Tamale Verde Cheese. These are both just delicious! I can’t even decide which one I like the best! I just love the sauce and the sides really turn these into a complete meal. So, really you don’t have to give up yummy foods to eat healthier. 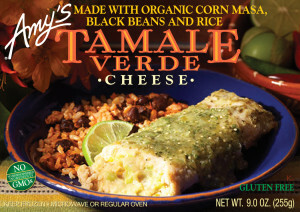 Check out all the delicious products at Amy’s! Thanks for this review! I just went to the store and bought the tamale meals!